Petrushevich, Ivan [Іван Петрушевич] – promoter of consumer co-operatives, active in political affairs, film script writer; born on 29 April 1875 in Yezupil (Tysmenytsia raion, Ivano-Frankivsk oblast, Ukraine; at that time – Stanislav county, Austrian crown land of Galicia); died on 28 July 1950 in Ukiah, California, USA. After graduating in 1898 from the University of Lviv, where he studied law and philosophy, he pursued further studies in Heidelderg, Jena, Prague and London (c.1901). In about 1904 he studied the theory and practice of the co-operative movement in Hartlepool. On returning to Galicia he became a promoter of the “Rochdale Principles” of co-operation. He also became a member of the Ukrainian Information Committee in Lviv. In 1913 he emigrated to Canada, where he organised Ukrainian agricultural co‑operatives and edited the Kanadiiskyi Rusyn newspaper in Winnipeg. In 1914-1915 he worked for the Canadian federal government on matters relating to immigration from Galicia. 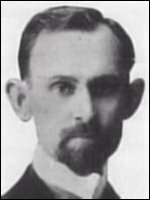 In 1919 he was sent as a representative of the Ukrainian Canadian Citizens' Committee to assist the delegation of the Ukrainian People’s Republic (UNR) at the Paris Peace Conference and became one of the delegation’s secretaries. During 1920-1923 he was secretary of the diplomatic mission of the Western Ukrainian People’s Republic (ZUNR) in London. While in London he was involved in an unsuccessful attempt to introduce Ukrainian studies into a British university, such as Oxford or the School of Slavonic Studies (at that time at King’s College, London). In 1922 his novel The Flying Submarine was published in London, under the pseudonym E. Van Pedroe Savidge. In 1923 he returned to Canada, and in the following year moved to Los Angeles, USA. He wrote film scripts for Hollywood and subsequently worked in the main municipal library of Pasadena, California. In 1945 he was a member of a delegation of Ukrainians from Canada and the USA at the United Nations Conference on International Organisation, held in San Francisco. A collection of Petrushevich’s papers covering the years 1910-1941 is held at the Hoover Institute, Stanford University, California, with a microfilm copy at Library and Archives Canada in Ottawa.